Feedback on The Wilderness of Ordurak has been pretty positive. The most recent comment, from today: “At a first glance, the module looks fantastic, a very “authentic” feeling I think.” Trying to match the SPI look was always a part of the intent, and it’s gratifying that backers of the project appreciate that about the adventure and the map. A couple playtesters have looked at The Sentinel Chapel and given some initial feedback. I’ve got a few more things to do for it, based on that feedback. It was originally aimed at being a “capsule adventure,” like some other DQ titles; something maybe a little less fleshed out. It was originally aimed at being 4 pages, but then I played with some SketchUp modeling, and I wanted to include that, and the descriptions grew, and now it’s pushing past the 8 page mark, and I have some further information to fill in. The story grew and fleshed itself out as I was writing, and it really does need another pass to bring it together. Some of the comments pointed out to me that it was much more of a first draft than I liked. And, as much of a map maker as I am, even though I’m using someone else’s map for the adventure proper, it really could use a regional map, so I’m going to do that for it, as well. Those still reviewing and playtesting I haven’t heard from yet, I’d really like to get your comments, too. This is another map with one of the two new fountain pens I recently added. 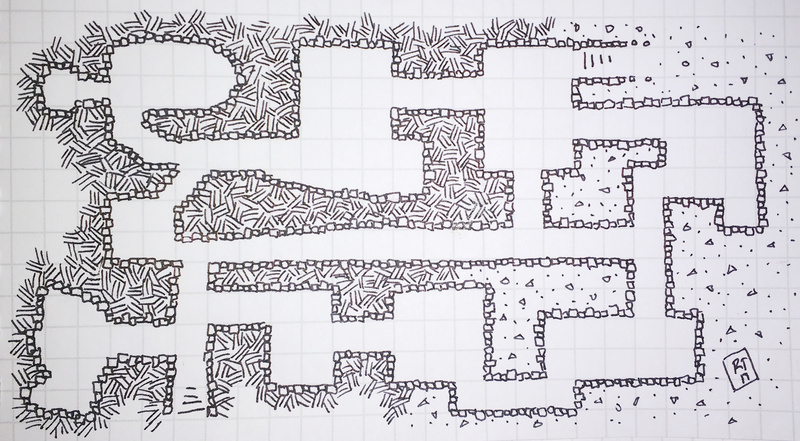 This is still something of a pen test, but a larger area, and enough to be considered as a small dungeon map in its own right. It’s the first fountain pen I’ve had that has a bladder converter, rather than a piston. Maybe I’ll change my mind over time (and there is something to be said for the quickness of the bladder over the piston), but I overall, I like the piston style better. I also have some blue cartridges I’m trying out in another fountain pen. They are certainly convenient, but I also like to use some bottle ink colors, and those tend to be nicer than the basic colors in cartridges. In retrospect, for this map, it might’ve been better to have the steps continuing downward in the darker background hatching, and kept the lighter fill pattern for the higher parts. Sometimes I include the doors and sometimes I don’t indicate anything; this map is one of the latter. I assume someone who wants to use one of these will add in doors where they think they are needed. There hasn’t been any strong feedback about it one way of the other, so I’ll continue with the mix. Here’s a quick, small map that was a first test of a new fountain pen. 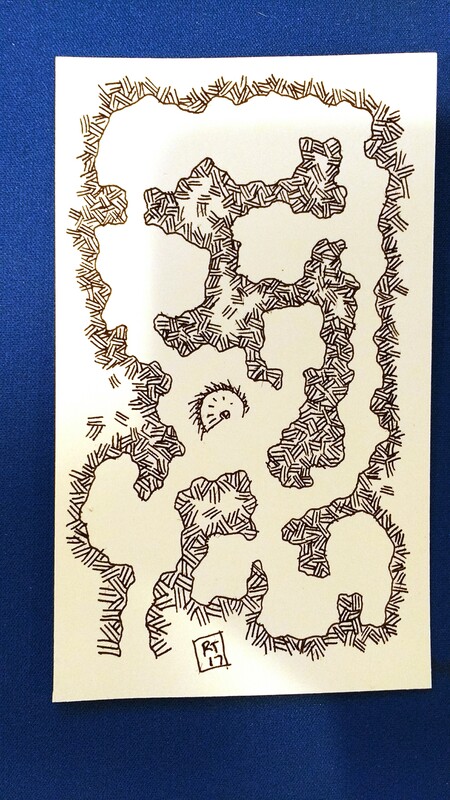 Pretty happy with this (the pen, that is, not the map; the map is just a doodle on a 3×5 card). I haven’t been posting maps as much as I had been, so it’s good to have something, even if it’s just a quick, little throwaway. The pen is one of two new fountain pens I got this week. I’ll probably do a bit of a writeup about both of them in the near future. I don’t recall anymore what path I was wandering when I came across this, but it falls in the ‘different tilings’ category which seems to be an onging interest of mine. It’s really a 3 piece pattern of a hex grid. 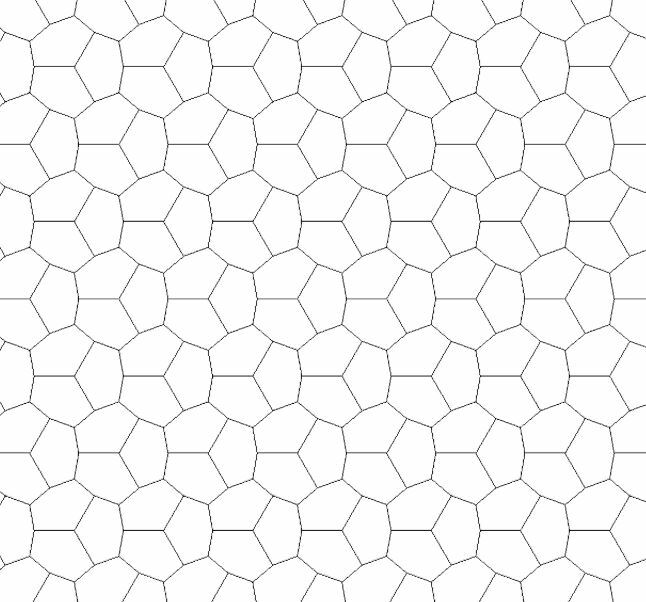 And here’s my cleaner version of this tiling. With more of pattern visible, you can more readily see the hex pattern made up of these triplets. It’s not really anything that’s going to be transformative, but it may be useful as a different way of looking at a grid and of having a different graphic presentation.